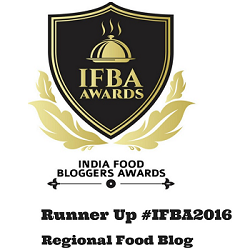 I like to blog not only because I love to cook but it also helps me to know a lot of new things and inspires me to try out ingredients that I never thought of buying. Zuchini is one such vegetable that I see each time on the fridge section of the Hypermarket where I do my vegetable shopping these days but never thought of reaching and picking them. I always thought these are some fancy vegetables that are used in continental dishes unless one day I saw this month’s theme for NCR. So yesterday, while picking groceries I finally walked that few steps to these dark green vegetables and put a couple of them in my basket. Hubby gave me a wired look when he saw these and asked the obvious question what are you going to do with these? I was as clueless as him so decided to give him a ‘Wait and watch’ kind of smile. Once home I googled and my ever trusted Wikipedia told me that The zucchini has a delicate flavor and requires little more than quick cooking with butter or olive oil, with or without fresh herbs. And I got my clue….Salad, which fits the NCR requirement perfectly. So with some more summer veggies I created this refreshing summer salad. Before I get into anymore blabbering let me thank you once again for inspiring me to bring these crunchy zucchinis home, which I am going to do again and again. Boil a big pan full of water with salt and put the pasta in it. Cook as per the time given in the packet. In the mean time slice all the vegetables (Potato, carrot, beans. 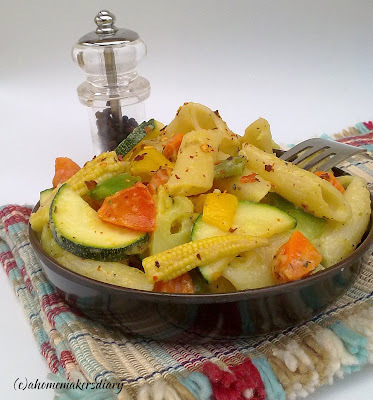 Cauli flower, zucchini, baby corn, capsicum) in small pieces and keep everything separate. Microwave potato, carrot, beans, cauliflower for 5 minutes. Also chop the onion and garlic. Heat 1 tsp oil and add the flour. Stir continuously till the raw smell is gone (approx. 2 minutes). In a steady stream add the milk while stirring the flour continuously. Try to avoid formation of any lumps. Season with salt and pepper and cook on low till it thickens a little. The consistency would not be very thick but it should be able to coat the back of a spoon. If you need extra water to make it thin use the water from the boiled veggies. Finally stir in the grated cheese and Keep the sauce aside. Once the pasta is done, drain the water and keep aside. Now heat one tsp of oil and add the chopped garlic and onion. Fry for a minute and add zucchini, capsicum and baby corn. Add a pinch of salt and cook for another minute. Take it off from the stove. In a big bowl put everything together and give it a good mix. Check the seasoning. Serve immediately or after chilling for 30 minutes. CWS: Peppers this month hosted at Padma of Padma's Recipes. also to Vegetable Marathon: Carrot at Seduce your tastebuds. and also to No Croutons Required this time hosted at Tinned tomatoes. This morning I had the left over salad mixed with a chopped boiled egg and it tasted excellent. 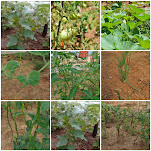 Other veggies that will work well in this would be green peas, salad greens, broccoli, cabbages etc. Homemade crumbled cottage cheese will also taste great in this. Sayantani, tomar salad dekhe hath badiye nite icche korche. Nischoi korbe, simple aar easy, to problem neyi. 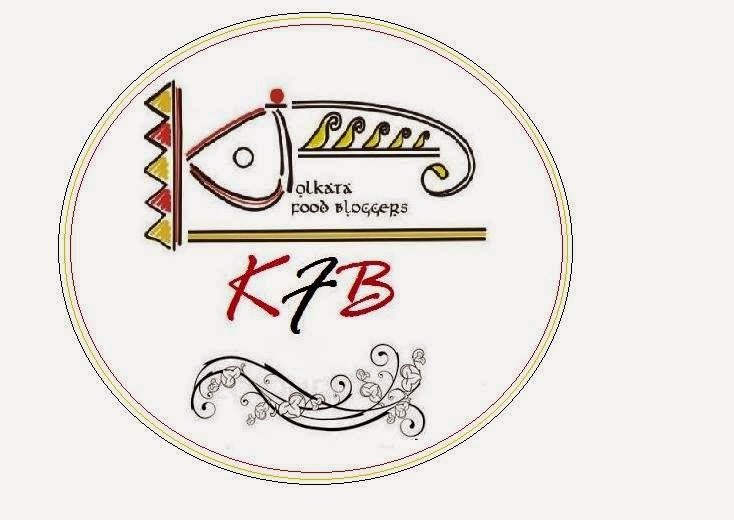 Ebar aar kotha bolar somay naaee...daroon chobigulo dekhe ektu pranta bhore-ni. 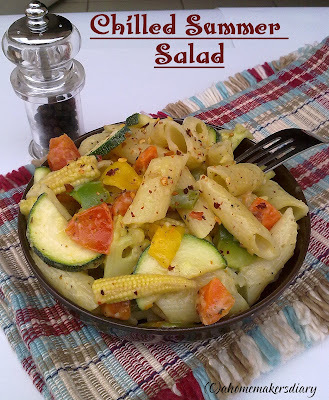 Summer salad, looks colourful, filling and awesome dear..
ami penne pasta diye salad banae, tobe zucchini de na , barite keyo khete chaye na abaar amaar bhalo lagey,at least tumaar DH eyi ta kheye anando to pelo..to finally silver nahole gold kicho kena holo? :-)..
What a comforting salad dear, zuchhini can be a versatile veggie. Salad looks very colorful Dear..I should try this sometime..perfect entry for all the events..Great click..
wow - I am in love with it already! Looks so delicate fresh and yum! Slurp! Great looking Summer salad, perfect. nutritious and tempting salad. perfect for weight watchers like me. colorful n delicious looking salad..very innovative dish..de-lish! What a delightful Salad! Yummm! thats a healthy salad out there. Looks colorful and good. Who wouldn't love this chilled salad with so much health, taste and goodness from pastas too! 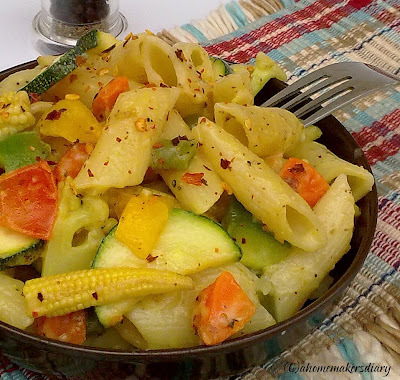 Excellent post Sayanatni..I love ur writing..it makes me smile..I'm glad u reached out to the Zucchini..and tried it and loved it..THis pasta is indeed all the pts u mentioned..healthy,delicious and quick and easy to make..I do experiment a lot too with pasta as my kids love it..(I hope u get ur silver earrings or that block printed curtains SOON...lol).. LOved ur inviting clicks as well. I wouldn't know about what brand is available. I know one thing though. Glycerine is available in medical stores. As long as it is consumable, you can even use that. Glycerine is just a lubricator or moisturizer basically. Hope that helps. Maybe someone who is in B're will be able to help you. what a gorgeous summer salad...my wife would love it! lovely and interesting salad, bookmarked!! Wow that's a delightful salad!!! !